This is Part 3 of a three part series. If you missed it, Check Out Part 1 Here and Part 2 Here. Feel free to read them in any order. 11. Learn and practice the cross body swing. Stand on the left side of the court, close to the net. Face the opposite pole so that your left shoulder is closer to the net and your feet are facing the same direction. Hit hundreds of balls over your left ear to the high line position WITHOUT TURNING!!! Don’t turn your feet, don’t turn your chest. If you want to hit the next level you MUST master the cross body swing. Add some jumps once you start feeling comfortable swinging cross body and not just doing a hook shot. It should still feel like a volleyball swing. Pay attention to the spin of the ball. You should be able to control TOPSPIN vs CORNER SPIN and SIDE SPIN. The cross body swing is Sean Rosenthal’s “go to.” In the clip below, he has a little rotation/opening to the line so it’s not the purest form of this swing and he annihilates this one so it’s not exactly what we are talking about. Still, as you can see, his feet land facing the sideline. You can use this style of swing to hold the defender in the diagonal and shoot calmly over the block. Now stand on the right side of the court. Face your feet and chest straight ahead to the back line. Practice hitting the right sided cut shot WITHOUT TURNING. I can’t say this enough. During our live training sessions where we practice Nothing But Shots for an hour, this can be the only key piece of feedback I give and my players will still notice themselves landing facing the spot they just hit to. To hit the next level, YOU MUST BE ABLE TO HIT AN AREA WITHOUT FACING THAT DIRECTION. This means before, during and after your swing. One tip that might help you learn if this is a new concept; Start by LOCKING your left foot in the sand during standing drills. That should prevent your body from turning with the swing. 12. Learn to show and finish in the same body position for each shot. Get into that same position we just talked about. Don’t let your feet turn or step. Don’t let your shoulders turn. Now hit a basket of balls into every spot on the court. You shouldn’t have to change which way you face to hit each spot. Most amateur players show you exactly where they are about to hit by turning their shoulders in that direction before contact. This leaves pro’s with the ability to beat beginners and intermediate players 1 on 2. MOST players hit where they are facing. The best hitters can hit every spot no matter what their shoulders are telling the defense. 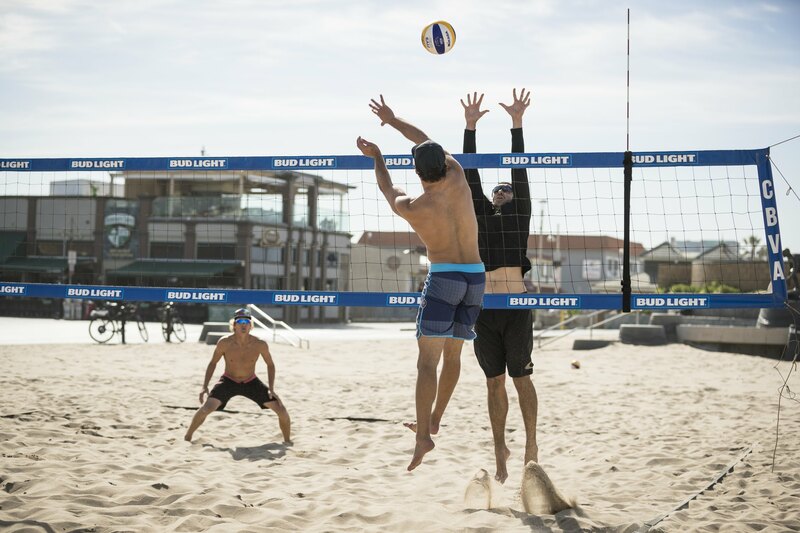 Lock your feet in the sand and your chest on one target. Don’t let them waiver. Divide the court into 9 sections and hit every one. 13. WAIT!!!!!!!!! Stay behind the ball. This is probably the NUMBER 1 killer of good attacks. I don’t know why but one of the hardest things to do in volleyball and beach volleyball is to leave tons of space in front of you while your partner is trying to set you. You need to see the ball go up from your setter before you even begin to truly accelerate. If you get under the ball, your power is cut and your vision is gone. WAIT! Practice not even moving forward until AFTER your partner sets. You will be surprised at how much time you still have to get to the ball and hit. Your last two steps should be quick anyway. Keep the ball in front of you. Let yourself FEEL very late and exaggerate this point. Practice taking the first step in your approach AFTER the set contact. You will start to get an idea for how much time you have. The heavy majority of pro’s (women and men) are on a first step tempo. That means that their right foot, the slow, first step in a 4 step approach is just getting onto the ground when their setter is in contact with the ball. Check out the beginning of this video to see what I’m talking about. Look how far back in the court Nick Lucena starts when Phil is setting. He keeps EVERYTHING in front of him for a long time and sometimes he’s even on a 5 step approach! Get the ball to the last foot of the court on every shot. Even if you are getting kills and winning your match. Demand supreme accuracy of yourself on every shot. Someday, you are going to run into taller, faster defenders and they won’t let anything inside that 3 foot perimeter fall. Draw a court three feet inside the lines and see if you can keep 5 out of 10 attacks in that perimeter. If you are REALLY advanced, play a match against your training partners with some extra ropes where the only area in bounds is the last 3 feet of sideline. If you can dedicate yourself to a drill like this, it will reap massive benefits in the long run. One of the most painful learning curves I had to go through was coming from open tournaments in New York (run by East End Volleyball) to qualifiers of AVP events. I was so accustomed to knowing that all I had to do was get the ball around the block with a correct decision based on where the defender was. I was being rewarded with points so frequently that I never even thought about needing to hit the last two feet no matter what. As you move through the ranks, players will be longer, faster, better readers who pursue EVERYTHING. Your shot game has to beat that tenacity and athleticism so embrace the journey to great shots and not just good ones. 15. Play Around the World at every practice. Draw four boxes, one on each corner of the court. I use one normal step to measure it from the corner but start with two or three step boxes. DON’T move on with your practice until you’ve hit each one 3 times with using a pass, set, spike out of the serve-receive position. Count how many attempts each box takes you, write it down, and improve next time. Super Coach and ex-pro player, Evie Matthews uses these targets for almost EVERY DRILL that doesn’t involve head to head competition. At least 80% of my practice time with him this year was spent on drills that ended in attacks at small targets. At minimum, make this your warm up drill for practice and then embrace the SAME EXERCISE for match warm ups. Use this for your pre-game routine! Hit each corner once then take two big swings. That level of focus should be enough to get your mind right for the match. If your warm up isn’t focused and you spend 20 minutes peppering before trying to bounce 20 balls, you aren’t mentally preparing for the battle and you are only tiring yourself out in the long run. 16. Create space for your hitting arm. This final key is EVERYTHING! For right handers: When attacking from the left side step away from your setter to the outside of the court before your approach. This move gives your setter plenty of room to lead your attack arm. If you have an indoor background, you know how much time is spent training left side hitters to “Get Outside!” The same principles apply on the beach. I hereby forbid you to pass and start an approach exactly from where you passed the ball. You want sets to fall on the right side of your right arm. On the right side, step closer to your setter, towards the middle of the court. This again gives your setter plenty of space to set a ball that can fall on the right side of your body AND inside the antenna. Sets that fall on the non dominant side of your body are a nightmare. They cut your power, your height and your ability to move the ball around. Check out this video AND SUBSCRIBE TO MY CHANNEL if you want to see new ones as soon as they come out. I have to make a note here for players who want their sets outside. If you are a right handed left side, you have to prepare for your outside set by getting literally outside the court to start your approach. Binstock did this at the 11:20 mark in the above video. Too many players call for outside sets when they aren’t in position to hit them. That call is going to lead to a set on your weak side. Get outside the court and THEN call outside. From the right side, this is different. Since we still need space on the right side of our body, we have to position ourselves a few feet inside the sideline when we call for the outside set. To relate this back to indoor. Left sides get far outside the court while right sides approach parallel with the sideline. To all you right handed right siders out there, STAY INSIDE THE COURT WHEN YOU CALL FOR THE OUTSIDE SET. If you are a lefty, you are going to have to switch all of this. Sets need to fall down on the left side of your left arm so take everything we just discussed and flip it. I hope you enjoyed this series or at the very least got something new to think about. Stay tuned for upcoming posts, videos and TRAINING CAMPS by following VolleyCamp Hermosa on Facebook and Instagram. OR Get our Free E-Book 36 Drills for Beach Volleyball and get all the tips, advice, discounts and perks that come with being a part of our email list.